In this case of high voltage generation, the instruction problem is server. If the armature is rotating, this is due to centrifugal states develop in the body due to the rotation. But if the armature is the stationery armature can be included easily even from vary high voltage up to 33000 volt. If the rotating armature stationary field system is provides. If require three slip ring to collect the emf and send it in the external circuit from rotating field system no slip ring are required. 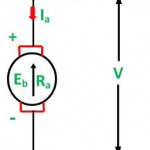 The emf which is produced in the armature and can be load out directly from the armature as the armature is stationary.